I’ve said it before, and I’ll say it again: I don’t think there’s a man, woman, or child in this country that doesn’t enjoy a good biscuit. But sometimes, you want something a bit more special, a bit more interesting than simply a plain biscuit, as good as it may be. Enter the sweet potato biscuit. Known in the South for ages, the sweet potato biscuit has only fairly recently made its way above the Mason-Dixon line, charming palates and winning hearts all the way. 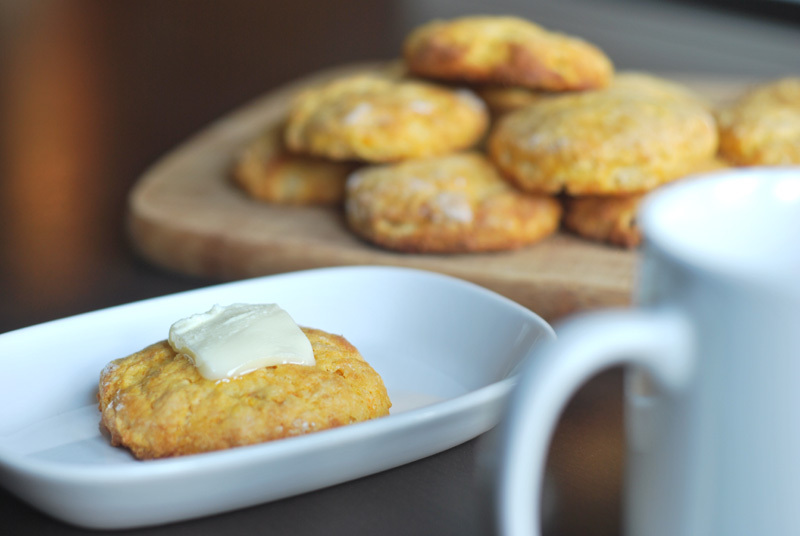 The idea is simple: biscuit + sweet potato = sweet potato biscuit. But how such a simple addition can result in something so universally beloved, so scrumptious, is still a mystery. Adding sweet potato to a biscuit adds a gorgeous orange hue and an earthy, lightly sweet flavor, one that goes perfectly with a slice of good ham and a spot of mustard or horseradish (or both). It also makes for a more tender biscuit, as it adds moisture, and – to a much lesser extent – the fibrous sweet potato helps shorten any strands of gluten that form. This is not license to over-knead or over-work your biscuit dough; but it does help a little, and every little bit helps with biscuits. These biscuits are, of course, an excellent addition to any brunch menu, sunny, cheerful, and wholly welcoming, stacked high on a plate. But as good as they are with simply butter and a cup of coffee, they’re just as good used for more savory applications. Try serving them with a seared duck breast, perhaps with a bit of cranberry (or any other tart berry) sauce on the side. If you prefer your lily gilded, throw a pinch or two of cayenne pepper into the dough. Sweet potatoes and cayenne are best friends, and would be just heavenly topped with a blushing slice of duck. My mouth is watering! 1. Preheat oven to 400° F. Pierce sweet potatoes a few times with a fork. Wrap tightly in aluminum foil, and bake for 45 minutes to 1 hour, or until very soft. Let cool, and remove skin. 2. In a glass measuring cup, mash 1 cup of cooked sweet potato. Stir in the milk, a little at a time, until the mixture measures 1 3/4 cups. Place mixture in the refrigerator to chill while preparing other ingredients. 3. Grease a large baking sheet, or line with parchment paper. Cut the butter into as small pieces as possible. Pile loosely on a small plate and freeze while preparing remaining ingredients. 4. In a large bowl, whisk together the flour, baking powder, and salt. Add partly-frozen butter and moving quickly, toss and pinch butter into flour with fingertips, tossing the mixture around to be sure to reach all pieces of butter, until the mixture resembles coarse meal. Large flakes or pea-sized lumps are just fine. 5. Add the milk mixture to the flour mixture, and fold quickly but gently with a fork or nonstick spatula until all dry ingredients are moistened and a rough dough forms. 6. Turn the dough out onto a floured work surface. With floured hands, press the dough together into a cohesive mass. Liberally dust the top with flour, and fold the dough in half (you may need to use a bench scraper to help with this). 7. Using a rolling pin, and dusting with flour as needed to prevent sticking, gently roll the dough out to about 1/2 inch thick. With a round cutter or a small drinking glass, and using a decisive stamping movement, cut as many biscuits as you can, cutting each out as closely as possible to the next one. Do not twist the cutter. Transfer the biscuits to the prepared baking sheet. 8. Gather scraps together by gathering in from the sides, pressing the cut sides together. Do not re-knead or re-roll for the best results. Form biscuits from scraps either by hand-shaping or by cutting. Transfer scrap biscuits to the prepared baking sheet. 9. Lightly brush the tops of the biscuits with milk. Bake the biscuits at 400° F for 20 to 25 minutes, or until lightly browned on top. Let cool on the pan for a minute or so, then transfer biscuits to a wire rack to finish cooling. Serve warm. 1. Biscuits can be stored at room temperature, wrapped tightly in aluminum foil, for 6 to 8 hours. Before serving, rewarm in a 350° F oven for 5 minutes. If not eating within that time, freeze, wrapped in foil. To serve, bake unthawed and unwrapped, for 10 minutes at 350° F.
2. You can bake the sweet potatoes up to 2 days in advance, and store in the refrigerator until ready to use. An added benefit with this approach is that it keeps your liquid mixture cold, so as not to melt the butter, crucial for making tender biscuits.